Hi, I’m Dr. Chris White, director of coaching and assessment at the Flippen Group, and I have a question for you. Have you ever had tension with someone? If so, there’s an itch you should have gotten, but probably didn’t. Speaking of itches, I had a small and noncontagious itch the other day from a basically invisible spot of eczema on my arm. It wasn’t a horrible itch, so I ignored it. Not too long afterward, the itch surfaced again. I scratched it momentarily and went back to “ignore mode.” Of course, a bit later, the cycle repeated itself! It was trying to tell me to do something other than scratch and ignore. That’s a perfect parallel for the topic of this blog. Anytime you have a touchy conversation or tension or misfire with someone, I want you to notice the itch – the feedback itch, that is! I want you – and of course, me – to get the itch to go get some feedback. I want you to have more muscle memory to solicit some input from someone. There was a misfire, so what could I have done better? I was recently at a dinner meeting with a high profile business owner who flew to College Station to meet with us. The meeting included two people from his organization and four people from ours. I had been out of town most of the week and had just gotten back that afternoon, so I was tired and looking forward to a relaxing dinner. I ordered some broccoli cheese soup and a sandwich, saving just enough room for dessert! Just before the food arrived, someone in my group said to the prospective client, “I know Chris has all the data graphs ready to go over with you tonight.” What?!? I had a moment of terror as my mind was reeling from the impact of his statement! What in the world was he talking about? What could I have missed? There’s no way I dropped the ball here, right?? I had some data from a previous meeting, but nothing whatsoever prepared for a presentation that evening. Unable to even articulate a response, I just looked at one of my other colleagues – who luckily bailed me out. Eventually, we decided to just enjoy a social dinner and hold business until the next day, but that was several minutes after my colleague’s seismic comment had rocked me. I’m actually not sure how I came across during those initial moments, but I’m sure my silence spoke volumes. So much for enjoying my tasty, relaxing dessert. The great news is that during the dinner and several times thereafter, I noticed the itch. I could have basically just ignored the invisible irritation, but I knew I needed to get some feedback from my colleagues about how I responded and how I could have improved my reaction. It turns out my colleagues did have some helpful insights about my behavior. When I asked for feedback, they said I could have handled the unexpected statement with more levity. Even a smiling and playful “Well, let’s talk about that a bit further,” would have helped. Instead, my body language and silence introduced some awkwardness. My face often communicates much more than I wish it did, so this was great feedback for me to hear. A great example of someone who injects levity like a pro is my colleague, Joy Chmeler. 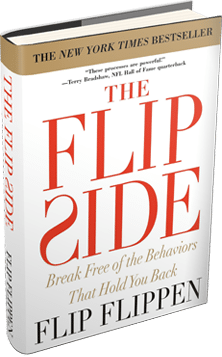 She was at a Flippen Group leadership event led by Lee Bason recently, and at the beginning he put her on the spot without warning, “Hey, Joy, tell the group about both of our behavioral constraints!” Totally awkward, right? In the midst of processing, she was somehow able to pull together the clever response, “Well, Lee, we just don’t have enough time.” I love it! That smile-inducing sidestep also gave her a moment to gather her thoughts before she did share about the constraints they are both working on. Paying attention to my after-dinner feedback itch, I also reflected on how I could have been more proactive before the meeting – to verify that we were on the same page, and so my colleague had better information to go on during the meeting. One last fact I forgot to mention, the colleague that threw me off that day is actually my boss and founder of this company. Oh, and yes, we had a great laugh about all this later. Not in the moment – but later. Quick warning label here. When you pursue feedback, there will likely be side effects. Most people are really bad at giving feedback, so if you expect someone to give you perfect examples couched in a perfect delivery, it’s not going to happen. Don’t set yourself up for some magical conversation when it’s not likely. Much more often than not, there will be some inaccuracy mixed in with some imperfect delivery, but that doesn’t mean we should avoid it. Let’s work out the muscle. Let’s keep fighting for those valuable but infrequent nuggets. If you’re really looking to up your game, here are two things you can do today to develop, or at least, act on the feedback itch. One, if you’ve had a recent challenge with someone, choose to get the itch. Decide to ask what you could have handled better. Two, when you get the input, be careful of cross-examining the messenger or being thrown off. Feedback is a gift, so chose your response by accepting the information and then reflecting on it. You don’t even have to agree. We often want closure in the moment, and that closure often comes with a cost – the cost being, us sounding defensive. Getting proactive feedback allows us to learn faster instead of slower. Hopefully, you’re seeking it instead of it seeking you. I don’t know about you, but I’m sick of learning things the hard way. The feedback itch is definitely an itch worth scratching. Are you feeling anything yet?